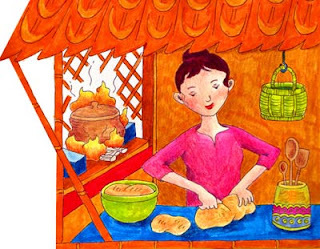 An illustration I created for a book entitled "Ranji the Baker"
Also my entry for Illustration Friday's theme "EQUIPMENT"
Illustration Friday is a weekly illustration challenge. have all week to come up with their own interpretation. I love your use of vibrant colors! beautifully done! i love your tropical color palette. thanks for stopping by! Congrats on your artwork being shown. HOW FABULOUS!!! You must be so excited! I'm so proud of you he he he he!!! Beautiful work- love the colors. Hey Maria! Congrats on the NYC art shows! That is so exciting. I know you'll be a smash. Love this delightful illustration from the book. The colors are perfect and your character design is fantastic. Looks like you've been pretty busy. Hey thanks for stopping by.